With all the restaurants going out of business in town, I’m excited to see some new life coming to some familiar locations. At some point last spring, I was out running and ran by the building on North River Road that was previously Spurlocks and then, once upon a time, a place I loved called Windows on the Levee. I noticed something about the defunct building… it had flowers growing in planters along the railing. Not accidental flowers. Someone had planted these. And that was my first indication that something was coming. Of course, it was a long time coming, but Town and Gown Bistro is finally here. At first when I heard the name, I was unimpressed, but it’s grown on me. When I read up that the owner is also the owner of the Runcible Spoon in Bloomington, that perked my interest. The Runcible Spoon has been a long standing establishment in Bloomington, which leads me to believe that this is someone who knows what they are doing when it comes to running a restaurant. I think we lose a lot of restaurants because we have fantastic chefs with great ideas, but who perhaps don’t have experience with the business aspect of running a restaurant. Yesterday, I got a chance to stop by the Town and Gown and try it out. Originally I believe it was only open for breakfast and lunch, but they are now open early and late, with all hours in between, and have a menu that includes breakfast through dinner. It’s been a long time since I’ve been in that building. It was practically empty when we arrived. The downstairs consists of just a few seating areas.The upstairs has a long bar and more tables. I’m happy to report that the bar is not just for show, it is a full bar so you can get everything from beer and wine to cocktails. It’s a small building, so very cozy inside. The staff was super friendly, and everything was clean and nicely organized. While there were delicious looking items on the menu, I’d heard that the breakfast menu was really the speciality, so I went straight for that. THe first thing on the menu caught my eye, it’s called The Bistro Egg Round. They toast a croissant, top it with fried egg and the meat of your choice with a side of home fries. It doesn’t sound like much, but man, you really can’t go wrong with a toasted croissant! It was really tasty. The home fries were just home fries. I keep hoping one day I’ll go somewhere and the home fries will be really excellent, but as of yet, all home fries are just kind of meh. Don’t get me wrong, I have never met a potato I didn’t like, so I ate them. 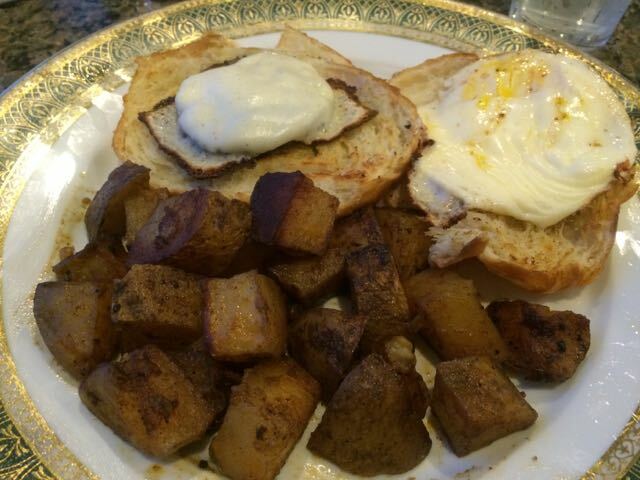 I just haven’t found the home fries that get me excited, and that’s really what my life needs…. exciting home fries. My friend had the Black Angus Medallions of Beef Tenderloin. 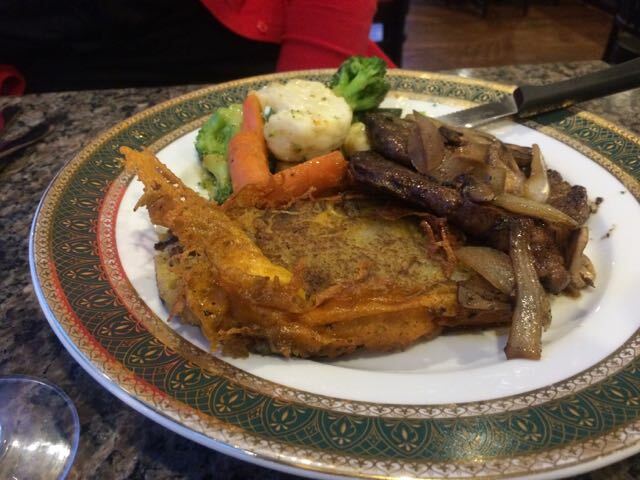 She reported that the steak was cooked exactly to order, not overcooked, and was very flavorful. The food was pretty good. There’s some room for improvement there, but I was happy with my meal and am looking forward to going back. I hope it sticks around for a while. I should also mention that the prices were really good. There was wine by the glass as low as $3.95. Breakfasts starting as low as $5.50, and dinners anywhere from $8-$15.